After serving a decade at one of those ‘mega’ churches with all the fantastic bells and whistles and state-of-the-art tech video recording hardware along with the professionals to handle it, I can agree that it’s mostly true. But it doesn’t have to be! Now, as a minister at one of those smaller congregations in the heart of the Texas hill country, I have to be satisﬁed using clumsy cameras on tripods. However, we made a decision to hard-wire stationary cameras mounted to the walls above the audience recording to decks hidden away. Doing this, I could accomplish the same thing without the clutter, but I would still have to spend time in post-edit. If we could add a simple switcher and one more deck we could do real time edits allowing us to record ANY event in the sanctuary, including our regular worship services, to burn to DVD for our elderly and shut-ins. Our budgeting allowed for four years of gradually buying the equipment we wanted, with a price tag of around $4,000. Once the plan was in place, the second guessing began. If we were going to spend that much money, were there other options out there we’d missed? I needed to make absolutely sure before I pulled the trigger. Going back to the drawing board, I listed exactly what we needed and started researching. The only products I found that could do everything we wanted were either the systems the ‘mega’ church were using, or a patchwork conglomeration of items from different companies…except one. Telestream’s Wirecast software on a PC could be used as a professional quality switcher to make real-time event recordings. Then with a Matrox VS4 on board, we could simultaneously record each camera feed for any needed post-editing. Mounting robotic controlled cameras (PTZ) on the walls instead of stationary ones would raise the price tag, but even with stationary cameras, I would have much better quality using Wirecast on a PC rather than switcher with a pile of recorder decks on a shelf. Right around that same time, a member had some funds drop into their control, so we moved ahead and ordered everything including the Wirecast software. The tech guys on the Wirecast forum were incredibly helpful, and told me that in order to simultaneously process basically four video feeds (three from the cameras on the Matrox board and the one being currently edited), we would need at least an i7 computer to handle the load, along with a massive drive for the video ﬁles. They also recommended putting the software and operating system on a solid state drive (SSD) so access would be immediate. Luckily, I was able to save money and assemble a system from scratch, rather than buying an i7 PC and having to add all those items. It was a pretty fast process! The computer was assembled over Christmas break 2014 and operational by early January. Cameras and wiring were installed during the next few months and our ﬁ rst recorded event with the new system was on April 7, 2013 – John Michael Talbot’s ‘Lords Supper’. If we had bought a stand-alone switcher and the ‘stack’ of recorders, we would have needed to eventually buy a computer with encoding software to stream events on the internet. Wirecast has everything needed to real-time edit an event and record it, and it was also designed to be the encoding software needed to stream events. Why buy a separate switcher and recorders when you can build or buy a computer that has a BETTER switcher and BETTER recording capability? Wirecast has it all! We use Pro Presenter software on a Macbook Pro to project lyrics and scriptures on a screen during worship. It so happens that Telestream has a neat little program called Desktop Presenter that adds an input shot to the Wirecast control which is the projected image. In addition there is a ‘Chroma Key’ option which will show only the white text so it can be overlaid on top of a camera shot. Frequent videos used in worship are easily added into the recording. We do use prepared artwork and graphics for title images then edit them, change dates, and change styles and fonts right from the Wirecast program. We also have used a pre-recorded video welcome inserted into the worship time speciﬁcally designed for the beneﬁt of the stream viewers. Any graphics or video clips are extremely easy to add for the operator. Another added help for our volunteers is using a Planar touch-sensitive 19” monitor I found used on Ebay, allowing us mouse-free operation. Numerous professional touches are always present in the ﬁnal results even when non-professional operators are at the controls. Volunteers can easily operate the multicamera computer controls and with additions like the very nice transitions and lower third options, it’s just not hard at all to produce a professional quality product. The volunteer video crew can be proud of the job they do with quality equipment and even have a desire to show up to be the operator because it’s actually fun. 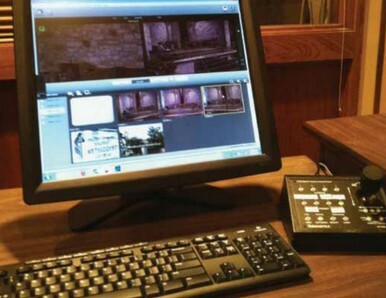 Yes, it’s true that the ‘BIG’ churches have all the cool equipment, but it’s also true that some smaller churches with smaller budgets can now produce quality video with the help of Telestream’s Wirecast software.